Earlier this year, I reviewed the second book of a series -- Attack at the Arena. A couple months after that, I was able to review two more books in the Imagination Station series. Peril in the Palace and Revenge of the Red Knight are books 3 and 4. I purchased book 1, but have never posted a review. So I was thrilled beyond belief to have the opportunity to review books 5 and 6. Without totally retelling the story I told in that second review... this series is targeting reluctant and/or struggling readers in roughly the 8-12 year old range. 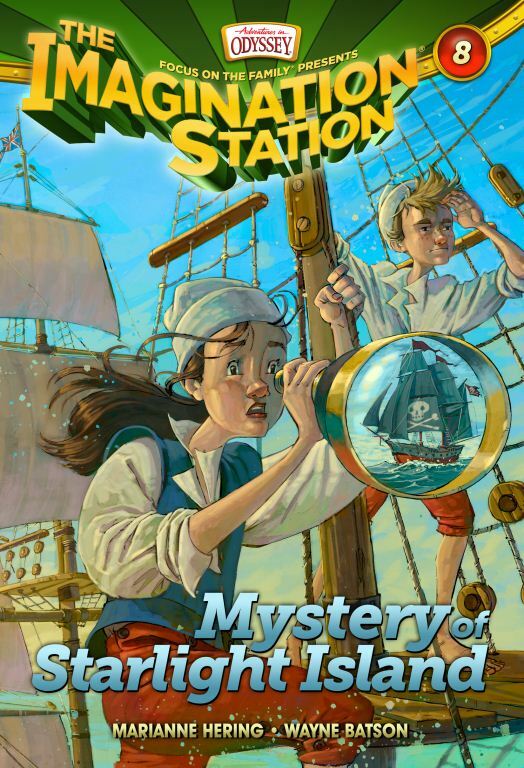 The series features boy/girl cousins traveling in time, and there is plenty of action and adventure along with the chance for the cousins to rub elbows with some pretty important people and to witness some key events of history. So strong boy appeal. And I'd think strong girl appeal too (but I can't judge that yet). I love books that I can give to my struggling readers. Both boys. There is NOT enough out there, and this is filling a space that needed filling. Book #5 is the one we spent the most time with. The basic plot of Showdown with the Shepherd? Patrick and Beth land in Canaan in the 10th Century BC. Coincidentally (!) they are saved from a bear by a shepherd boy named David... who is on his way to bring food to his brothers who are fighting the Philistines. You can guess where it goes from there. The big lesson "the cousins learn [is] that having a giant faith is more important than having a giant on your side." Connor (my non-struggling-reader teen) read this book quickly, and he enjoyed it. 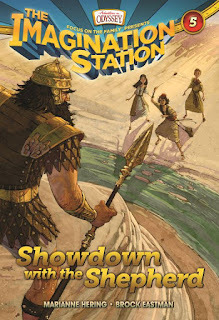 He appreciated that the series was bringing biblical history into the mix, but he commented on how he "prefers his time travel stories to involve characters who aren't quite so slow to grasp what is occurring around them." But he also stated that this was a "fun, quick read" and that he really does enjoy the series. William, 12 and definitely a struggling reader, read this aloud to me. He had the same hang-up that Connor expressed. He was very frustrated that it took Patrick and Beth so long to figure out that this was "the" David. So basically the same complaint that Connor had... and I have to admit, from listening to the book being read, I definitely had the feeling Patrick and Beth were pretty clueless on biblical history. I didn't notice that so much with the other titles... I mean, how many tweens know anything about the War of the Roses or Marco Polo? But David and Goliath? What I determined in this is that William -- who will turn 13 in another couple weeks -- is hitting that point where some of the formulaic plots annoy him. I think if he was reading better it would be different, more like Connor's reaction. Since it does take William awhile to get through a book, though, he finds some of the stuff frustrating. When I asked, however, if he wanted to skip reading book #6, he was quick to tell me that he'd read it "if you really want me to." Said in that Fred Savage of Princess Bride way... where he seems to be desperately trying to cover up the fact that he really is interested. Problems in Plymouth, if it isn't obvious from the title, involves people like William Bradford, Miles Standish and Squanto. And Hugh causing lots of trouble. The year is 1621, and the first Thanksgiving is about to turn out quite different from the version Patrick and Beth had learned about. We are not far into this, I will confess. I skimmed it though, and basically it appears to be very similar to the previous five titles. Some great historical information, lots of action, and the cousins not quite catching up with Hugh to set history all back to rights. 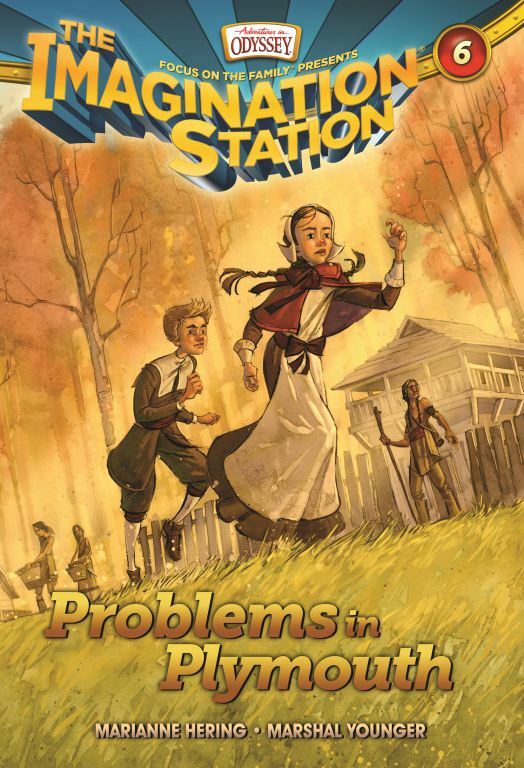 I still think this series is fantastic, and great for reluctant or struggling readers. All three of my older boys really do agree. At this point, we are halfway through the planned 12-title series, and I fully intend to acquire the rest. I am planning to have Thomas start reading from book #1, because I think these would be perfect for him. One thing I really noticed with this title is the repeated vocabulary. William will stumble a bit with a word, but then encounter that same word 2-3 more times in the next couple of pages. I assume the authors did this intentionally... and it is a confidence booster for my son. So... a giveaway! I'm blessed to be able to offer a set of books #5 and #6 to one lucky reader. This is only open to those in the US or Canada, please. Giveaway will end at midnight Eastern time on Sunday night, November 20. Disclaimer: I received these books for myself and a set to giveaway from Side Door Communications. No other compensation was received. All opinions expressed in this review are my own. My grandchildren would love this giveaway. Thanks for the chance to win it. Secrets of the Prince's tomb sounds wonderful. We have the first few books in this series and love it! I visited the Imagination Station website. (I couldn't get your link to work so I googled it.) I really like the additional information they provide about the Vikings and Romans. And it is at an easy reading level! Jenny -- thanks for telling me about the link. I forgot that I was going to check that... duh! It felt weird as I was trying to enter it. I love the reading level. Just love it. Ok, so now I read the instructions about leaving a comment. The books that appeal to me the most are the ones that deal directly with history so we can plug them into our school studies (Vikings, Romans, Pilgrims). With my daughter who struggled with reading, I was always trying to find books that content wasn't too juvenile. She had a high vocabulary and comprehension when she listened to books on tape. And she loved a complicated plot. It was the mechanics of reading that she struggled with. It is hard to find good easy readers that aren't narrowly written for a 5 year old. I think I like the Secret of a Prince's Tomb best of all the titles. "It is hard to find good easy readers that aren't narrowly written for a 5 year old." YES! I'd have said 6 year old, LOL, but YES! I find that many books are written on his reading level are more babyish in language. It would be nice to have some books that have word repetition without sounding like it is being read to a baby. I've been interested in Attack at the Arena since you first reviewed it. I think Brennan could use the extra practice. Since it is November, I'm gonna have to say the Problems in Plymouth appeals to me most. I visited imagination station and read a couple pages in one of the Click books, and I love these books. They look like a great easy reader similar to Magic Treehouse only Christian. I had no idea they existed and we will be getting these for Anna when the time comes! I will get all twelve. One way or another. These sound great! I think my son would like Attack at the Arena! I look for anything that will get my son to love reading! With him struggling so much, it seems like a chore when he has to read. Here and there we stumble upon something that he loves, and wants more of!! I didn't know about most of their products, but the interactive CDRom games look fun! I learned that there is a secret word in each of the books. -- Athena, my daughter is a struggling reader too. I would love to know which books your son has wanted more of! I am always looking for books that will engage her enough to want to work hard, because reading is such hard work for her. She is not quite ready for these Imagination Station books but she is getting close now. We are all about everything Egyptian, so the new Egyptian one looks awesome! We are just now beginning reading, so we take it in pieces... he'll read until he's tired; I'll read a little, and then we'll take a break and come back to it later. 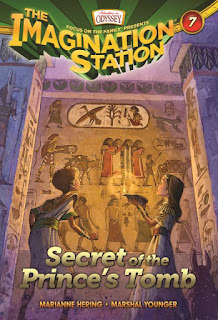 Secret of the Prince's Tomb looks the most interesting to me. I have a 9 year old (3rd grade) moderately dyslexic daughter. She reads on a late 1st grade level. It is difficult to find books that are easy enough for her, but which aren't babyish. Oh my! They offer a lot of parent helps for the books. Vocabulary lists, background information, and a place to enter a secret word from the book--I guess that unlocks something??? I looked at the preview pages and this looks like something my daughter would love. Gratitude Challenge: He's a teen! Review and Giveaway: FFH "One Silent Night"